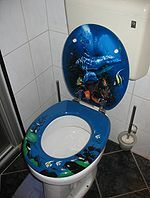 A toilet with a colourful toilet seat. A toilet on an airplane. A toilet is where most people get rid of bodily waste (urine and feces) into water where it will then be flushed into a sewage system. A room that has a toilet in it can be called a "restroom" or a "bathroom" in the United States. In other places it may be called the toilet or the Water Closet (WC). The average person spends three years of their life on the toilet. Almost all modern buildings have at least one toilet. In the home, a toilet may or may not be in the same room as a shower or a bathtub. Some toilets are outside, in an "outhouse". A public toilet may or may not cost money to use. Toilets that cost money are called "pay toilets". Public bathrooms often have many toilets with walls between them. This makes areas called stalls (US) or cubicles (UK). Bathrooms for men often also have separate urinals. Urinals can either be on the wall for a single user, or a basin or trough for many men to use at the same time. Urinals on walls sometimes have small walls or dividers for privacy reasons. Outdoor public toilets (in the street, around parks, etc.) are a form of street furniture. These toilets are in individual cubicles. Some are simple and have little or no plumbing. Others are less simple, and some toilets even clean themselves after every use. Some toilet-cubicles are mobile and can be put in place where and when they are needed. These toilets are called "portable toilets". Portable toilets are commonly used at large outdoor events like concerts, festivals or carnivals. ↑ "CBBC". British Broadcasting Corporation. http://news.bbc.co.uk/cbbcnews/hi/newsid_4390000/newsid_4394200/4394226.stm. Retrieved February 10, 2012. This page was last changed on 11 September 2014, at 17:12.